The hedge roots around Hexton were spangled sherbet-yellow with primroses, and the catkin-laden hazels were loud with explosive bursts of chaffinch song, as I set out along Mill Lane from the Raven Inn. Across the north Hertfordshire fields on the southern skyline, sinuous chalk hills looked out towards the great clay plains of Bedfordshire, misty and cool in this fresh March morning. 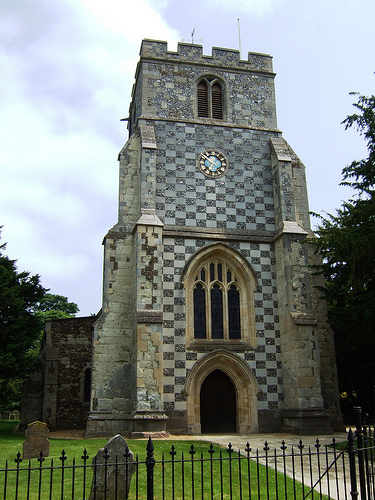 Hexton’s neighbouring hamlet of Pegsdon lies in a southward-bulging salient of Bedfordshire. The signboard of the Live and Let Live pub showed a dove and a peregrine falcon sitting amicably together by an unloaded shotgun. So there are miracles still in the borderlands, just as the Bedfordshire tinker, fiddler and outlawed nonconformist preacher John Bunyan saw in visions when he roamed these hills in Restoration times – visions that drove him to compose The Pilgrim’s Progress in the prison cells he was so often confined in. On the southern skyline rose the Pegsdon Hills, the ‘Delectable Mountains’ of John Bunyan’s fable. 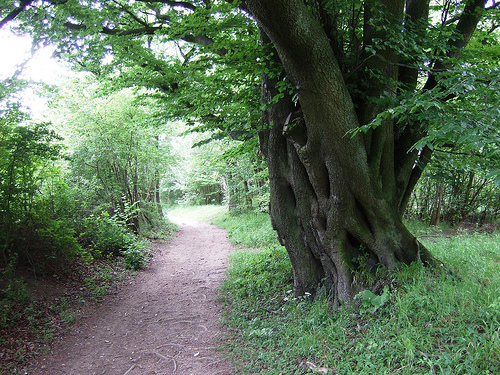 A winding path and hollow field lanes brought me to where the ancient Icknield Way, deeply sunken in a tunnel of beech and hornbeams studded with green buds, rose along the nape of the hills. The 6,000-year-old highway ran rutted, grassy and sun-splashed past Telegraph Hill where a gaunt semaphore mast was once sited by the Admiralty, one of a chain that passed signals between London and far-off Great Yarmouth. A little further along rose Galley or Gallows Hill, a place of ill-omen in Bunyan’s time, where witches were buried and the tar-soaked bodies of executed criminals hung to terrify passers-by who fervently believed that Gallows Hill was haunted by a dread Black Dog. I turned off the old track, heading north over the rounded sprawl of Barton Hills. 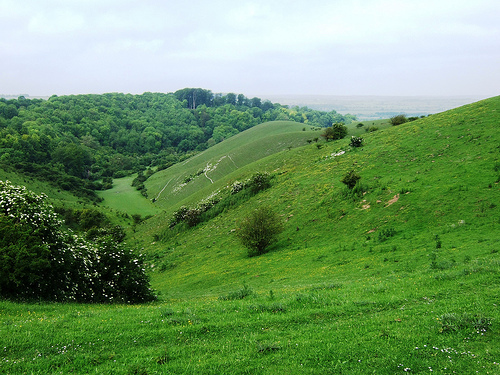 A nature reserve with dry chalk valleys too steep to plough, the hills remain a beautiful stretch of unspoiled chalk grassland. Trees disguised the ramparts of Ravensburgh Castle, the largest hillfort in south-east England. In 54 BC Julius Caesar attacked and stormed a hillfort in this region that was defended by the British warrior leader, Cassivellaunus – it was most likely Ravensburgh. Beyond lay Bonfirehill Knoll, in former days the scene of the Hocktide Revels shortly after Easter. It doesn’t take much post-Freudian analysis – especially in rampant spring – to work out the symbolism of ‘Pulling the Pole’, a game in which the men of Hexton tried to keep an ash pole erect on the hill, while the women strove to collapse it and drag it down into the village. Strange to relate, the women were always triumphant. I made my way down the hill and over the fields to Hexton, with plenty to ponder. Road: M1, Junction 12; A5120, then minor road to Harlington and Barton-le-Clay; B655 to Hexton. Walk (10 miles, easy grade, OS Explorer 193): Leaving Raven Inn, turn left; on your left; walk up road past ‘No Through Road’ sign and continue for ½ mile (0.8 km), along Mill Lane, past Hexton Mill (blue bridleway waymarks), to pass between Green End and Bury Farm, and on to meet road (120306). Right for 300 yards, then left to pass Live & Let Live Inn (121303). In 100 yards, just before B655, left up Pegsdon Common Farm drive (fingerpost, ‘Private Road’). Rounding a left bend, go right (125305 – fingerpost) up grass path and up steps, then on up right side of conifer plantation. At end of trees, continue along rim of dry valley to waymark post (129304 – Chiltern Way/CW waymark). Left along edge of escarpment for 300 yards; right along sunken lane (CW). Pass entrance to Knocking Hoe NNR and go over stile by gate (133305). Left (CW) for 150 yards, then right along field edge path (blue arrow, ‘Walk on the Wild Side’ waymark) for 500 yards to B655. Right for 250 m along grass verge, then through car park and through gates and stiles to join the Icknield Way (132300). Icknield Way climbs for nearly 3/4 mile, then levels off. In another 400 m, look on your right for kissing-gate with brown ‘Access Land man’ logo (121291). 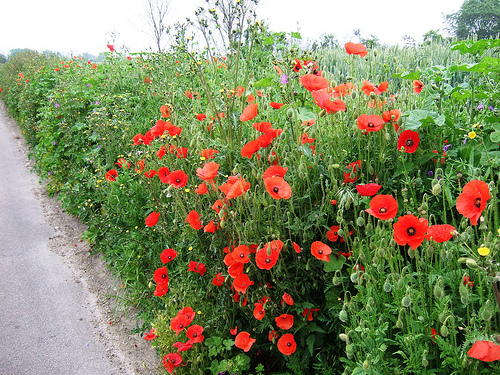 Continue along Icknield Way; at a fork in 150 m, keep ahead for 3/4 mile to meet a road (109282). Forward along verge for 500 yards; where road bends left under power lines, forward along Icknield Way for 2/3 mile to cross John Bunyan Trail (unmarked on ground) on edge of Maulden Firs (096275). Ahead for another 300 yards, then fork left (093273) to ascend Galley Hill. From Galley Hill return to Icknield Way; retrace steps for 300 m to edge of Maulden Firs wood; left along John Bunyan Trail, under power lines for 2/3 mile to road (093284). Right for 150 m; left (fingerpost) through trees on path past Barton Hill Farm for 2/3 mile (1 km) to pass gate of Barton Hills National Nature Reserve on your left (092296). Continue along track, noticing on your right the thickly wooded rampart of Ravensburgh Castle, and beyond it the tree-smothered Bonfirehill Knoll. Follow track down slope for 2/3 mile to T-junction with lane (085303). Right past church to B655 in Barton-le-Clay (085305). Right for 50 yards, left along Manor Road. 100 yards past gates of Ramsey Manor School, right (086310 – fingerpost) down path, over footbridge and follow field edge. In 100 yards, ignore arrow pointing left; keep ahead for 1 mile along field edges, to cross footbridge (104311) and the final field into Hexton. 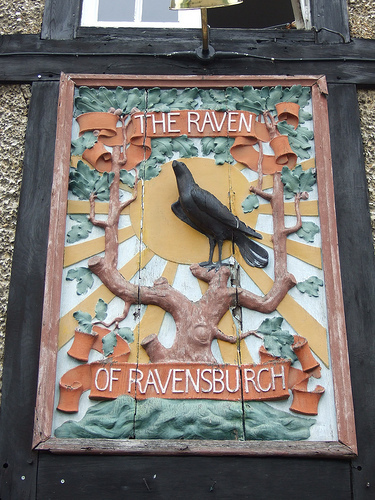 Turn right to Raven Inn. Dear Mr Somerville, Re: “A Good Walk” Icknield Way, Hertfordshire in todays “Times”, a small sadness for all of us who love Bedfordshire, you could have done us a favour with the rest of the country!! The walk you describe is in Bedfordshire not Hertfordshire. Thank you for your email. I, too, am a fan of often-disregarded Bedfordshire! But my walk is in fact half in Herts and half in Beds, beginning in Herts at Hexton. 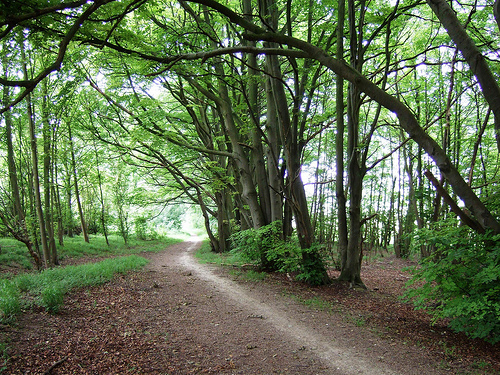 In my defence, my own heading as submitted to the Times was: ‘Hexton and the Icknield Way, Herts/Beds’. They must have subbed out the Beds bit.